PORTLAND. 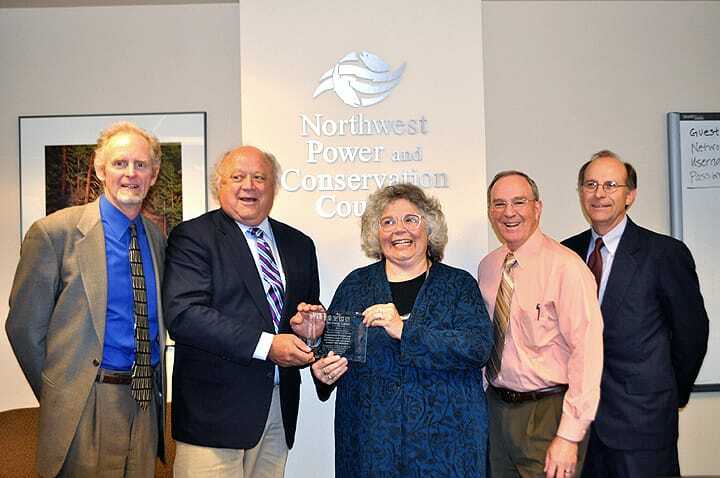 Ore. – In recognition of the most far-sighted, clean energy-based power plan in regional history, the NW Energy Coalition last week presented its highest award to the Northwest Power and Conservation Council. The NW Energy Coalition, a 30-year-old regional alliance of more than 110 organizations committed to clean and affordable energy, annually bestows the Bob Olsen Memorial Conservation Eagle award to individuals and organizations that demonstrate leadership for a clean and affordable energy future. This year’s award goes to the Council members, staff and advisory committee members who produced the Sixth Northwest Power and Conservation Plan in early 2010. The plan projects the next 20 years of regionwide electricity needs and prescribes the means of meeting them. The Sixth Plan tells Northwest utilities they can and should meet 85% of new needs with bill-reducing energy efficiency and most of the rest with new, clean renewable energy. “The Council, its staff and advisory committee members were chosen for creating the Sixth Northwest Power and Conservation Plan, a road map for reaching a clean energy future that benefits all Northwest families and businesses,” Coalition executive director Sara Patton explained. Patton presented the award during the Council regular monthly meeting last week in Portland, Ore. The Council is the region’s official power planning agency. It consists of two governor-appointed members each from the states of Montana, Idaho, Oregon and Washington. It updates its 20-year power and conservation plan every five years. Utilities across the region use the plan as a guide for choosing the best resources for meeting their customer’s power needs. For more information on the Northwest Power and Conservation, visit www.nwcouncil.org. For more on the Sixth Northwest Power and Conservation Plan, go to www.nwcouncil.org/energy/powerplan. 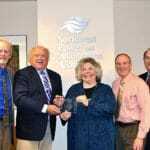 The Eagle award is named for former NW Energy Coalition chair Bob Olsen, a longtime public utility district commissioner in Washington state who dedicated more than 20 years of his life to securing regional investments in cost-effective energy efficiency and to protecting energy consumers. Olsen died in 1994.